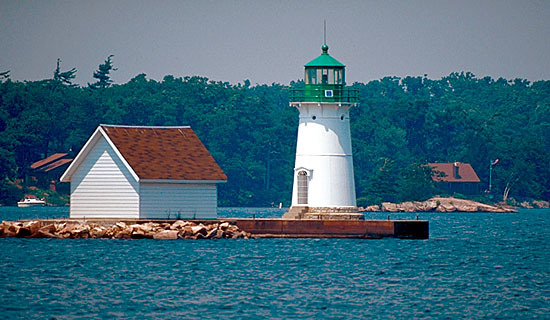 This little tower sits on Bush Island in the St. Lawrence River in the Thousand Islands area. Construction dates from 1847. The site is quite picturesque, with nearby Heart Island and Bolt Castle adding to the stunning view of the river from downtown Alexandria Bay. The river is a surprising 250 feet deep in this area, and large vessels travel between the Great Lakes and the Atlantic Ocean.